Local singing legend Becks Roberts is back at the Trades with her band The Bullets promising a heady mix of ska, pop and jazz guaranteed to fill the dancefloor on Friday night. Becks and the Bullets use all their musical, stage and TV experience to produce a unique blend of sound and quirky stagecraft that is bringing them a national reputation as one of Britain’s best live acts. The Bullets were once described as the offspring of Blondie if she had kids to Ian Dury and the Blockheads and those kids had grown up next door to Jarvis Cocker. Before all that mayhem Steve Tilston hosts another of his popular Roots nights on Thursday with French chanteuse Flossie Malavialle bringing a mixed bag of influences from Edith Piaf to jazz, rock ‘n’ roll and soul to the club. Flossie started her career in the famous ‘Orchestres de Varieties’ before joining the English folk circuit in 2002 where she has become one of the most popular singer/songwriters around. Unusually for a folk act Flossie's number one aim is to get people up and dancing so Steve’s regulars had better bring their dancing shoes with them for a bop. On Saturday Hebden Bridge native Sarah Joy brings her band Elephant Talk back to Yorkshire for a hometown gig promising uplifting Urban Folk for the head, heart and dancefloor. Sarah began her career with Elixir before heading off to Bristol to work with electro producer Tim York. Sarah’s unique voice is backed up founder member Jon Maybey on guitar, mandolin, loops and programs with former Chieftains sideman Matt Tarling on fiddle. Elephant Talk have released five albums but they are another band who have made their name blowing away crowds on the festival scene with critics describing their music as ‘original, hypnotic and inspiring’. This tour sees them showcasing a new set of material plus some old favourites laced with traditional Breton, Celtic and Eastern flavoured influences. Once Elephant talk have finished the Funk Ugly DJS take over for an upbeat evening of cool funk and set packed with funky reggae courtesy of guest DJ Mick Moore. “Becks has been creating a community choir at the Trades for some months now so it is great to see her back doing what she does best which is leading one of the live bands in the UK,” Trades Club spokesperson Paul Clarke told the Hebden Bridge Web. 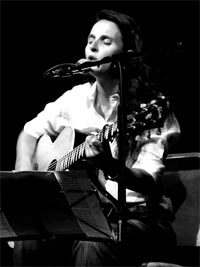 “Steve Tilston’s roots have consistently hosted some outstanding artists and Flossie Malavialle is sure to live up to her promise to fill the dancefloor. Tickets for Flossie Malavialle (£10), Becks and Bullets (£7.50) and Elephant Talk (£7.50) are available from the Trades Club at on 01422845265 or boxoffice@tradesclub.org.